If you consume a lot of rice in your regular diet, then one thing that you will already be aware of is that it is notoriously difficult to get it right. It is very easy to undercook or overcook it and this can make it very off putting indeed. As well as this, it is also important to take into consideration the fact that different types of rice require different cooking methods and times. Because of this, your best option is to invest in a rice cooker. By doing this, you can make sure that you are able to serve perfect rice every time. There are many rice cookers on the market at the moment and it can take quite some time to compare them all. Because of this, we have decided to test and review our favourites. Please read on below to find out which models we think are the best rice cookers on the market right now. Very energy efficient rice cooker. Adjustable temperatures so you are able to perfect your cooking methods. 4 different rice cooking methods. What initially drew us to this model was the fact that it seemed very high tech. Once we had taken a look at the cooker in person, it was clear to see that this was definitely the case. The first thing that we really liked about this rice cooker was the capacity. You are able to fit five and a half cups of rice in the dish with each use. This is more than enough to feed a family with leftovers too. Next, we were really pleased with the fact that there are cooking options for 4 different types of rice – sweet, white, brown and sushi. This covers most bases. One impressive feature with this cooker is that it also doubles as a steamer which is perfect for creating healthier dishes. Using the rice cooker is very easy. There is also a nice LCD screen which allows you to navigate the menus with ease. All of the programs are very effective and we had no trouble at all in using any of them. 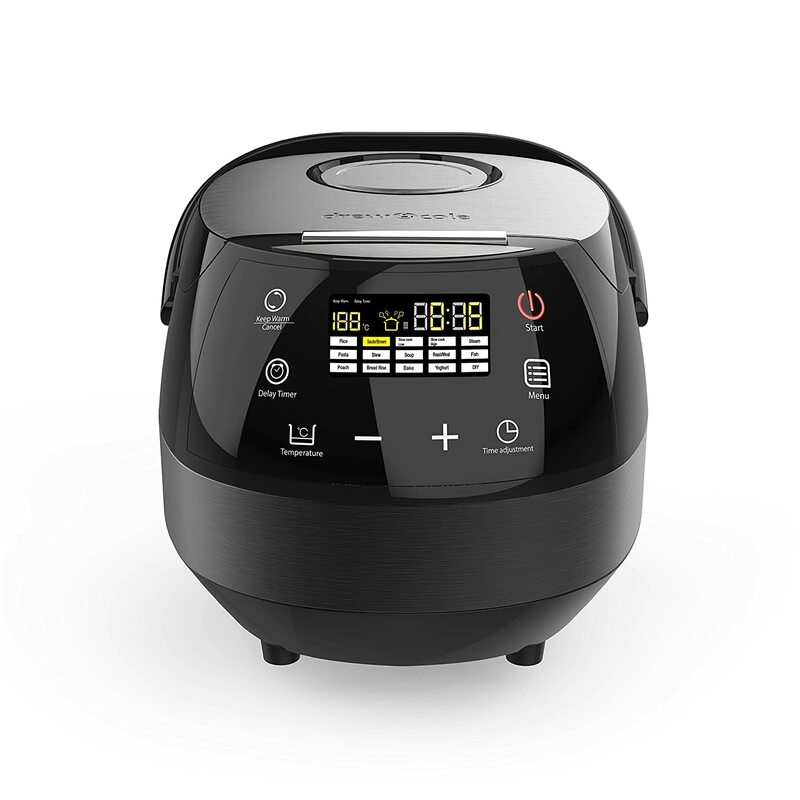 Overall, we were very impressed with this rice cooker and highly recommend it if you are able to spend a little extra money. 7 different programs to choose from. Adjustable temperature for more accurate cooking. Quite energy efficient for a large rice cooker. Figuring out all of the programs can be a little challenging. Next on our list of the best rice cookers is this one from Drew & Cole. We chose this one because it is something a little different. Rather than being just a rice cooker, it is actually a multi cooker. There are 7 different cooking modes with this model – rice, slow cooker, steamer, soup maker, and bread maker. We tried and tested all of the different cooking modes on this cooker and we were so impressed with the results. We found that they were incredibly effective and all of the food that we cooked was cooked to absolute perfection. One of the things that we really liked about this cooker is the fact that it has quite a large capacity. At 5L, you are able to cook a lot of rice at one time, so this is definitely the best option for small families. The adjustable temperature is another handy feature. The only issue that we had initially was navigating all of the different programs on the menu. Once we had figured out the menu properly it was quite straight forward, but the instruction manual could be a little clearer. 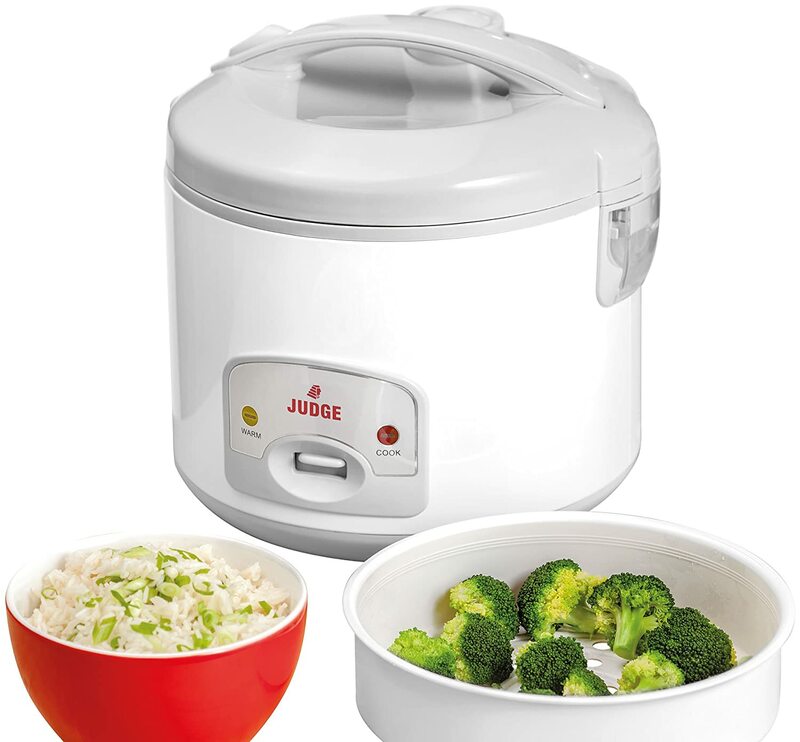 Overall, we were pleased with this rice cooker and would definitely recommend it. Powerful with a wattage of 1000w. 7 different cooking modes for the best results. Menu is difficult to navigate. Safety features could be better. 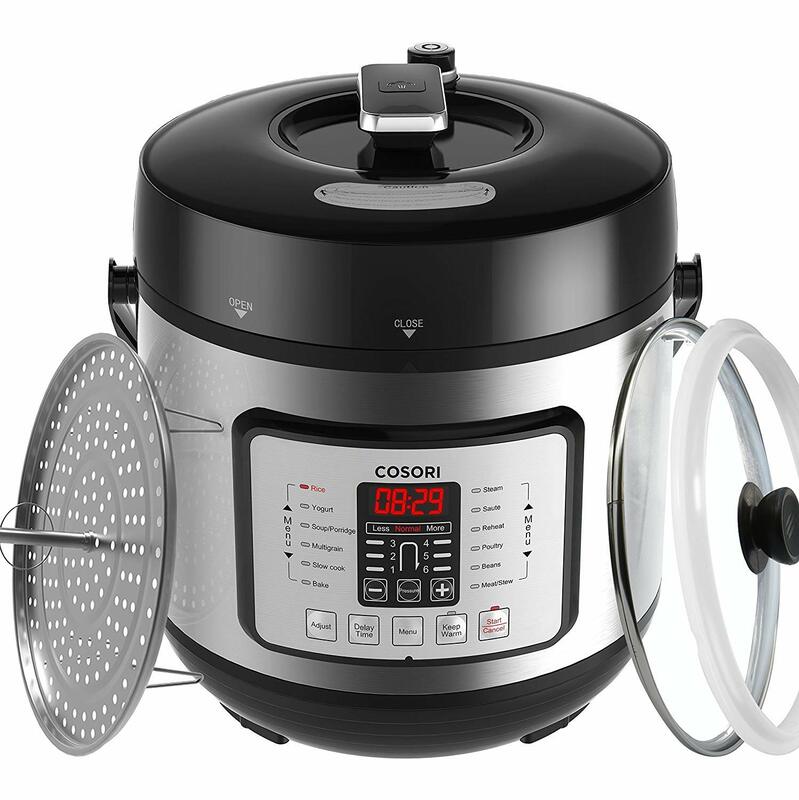 Next up we have a rice cooker from COSORI. We hadn’t heard of this brand before so we weren’t really sure what to expect but we were actually really impressed with the results. What initially attracted us to this multi cooker is the design. It has a really modern sophisticated style which really looks great. There were actually several different features that really impressed us with this rice cooker. First of all, we really liked the extra-large 6L capacity. We found that this was perfect for cooking large quantities of rice which is perfect for larger families. The powerful wattage of 1000w was another nice feature. We also really liked the fact that we were able to take advantage of 7 different cooking methods – rice cooker, slow cooker, food steamer, yogurt maker and more. We tested out all of the programs and didn’t have any problems with any of them and were very pleased with the results. The only issue that we did have is navigating the menu. There is a nice LCD screen which is very easy to read, but choosing the different settings was quite the challenge. However, this aside, we would still recommend this rice cooker, especially to larger families. Small rice cooker so perfect for smaller kitchens. Very easy to use thanks to the basic design. Given that most of the cookers that we have added to our list of the best rice cookers fall between the mid-range to high-end bracket, we decided that it was only fair to add some rice cookers that are cheaper to the list and decided to test out this model from Judge Horwood. Although this is a cheaper rice cooker, we have to say that we were still quite impressed with the results. This is listed as a family rice cooker, but with a capacity of only 1.8L, we felt that it was more suited to single people or couples. 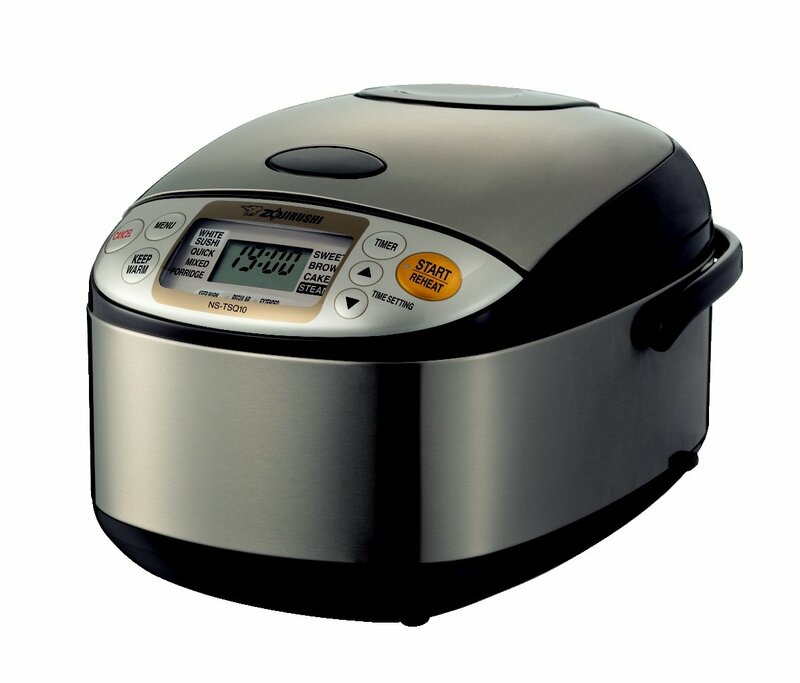 The main thing that we liked about this particular rice cooker was how easy it was to use. Because it is a very basic model, the settings are very easy to navigate and the cooker in general is far easier to use than some of the others that we have tested and reviewed. Another thing that we liked was how small this rice cooker is. It is absolutely perfect for those who have a smaller kitchen. Although this is a very basic rice cooker, it is perfect for those who are looking for something that is inexpensive and easy to use. Very basic design with no extra features. Last on our list of the best rice cookers is this model from Judge. We felt that we should add this to this list for those who live on their own and just want a rice cooker that is suitable for cooking for one person and this cooker really fits the bill perfectly. It has a tiny capacity of just 0.3L which is absolutely perfect for cooking for one person. Another thing that we really liked about this one is the very low energy consumption of just 200w. We found the biggest plus point with this one is how easy it is to use because of the incredibly basic design. 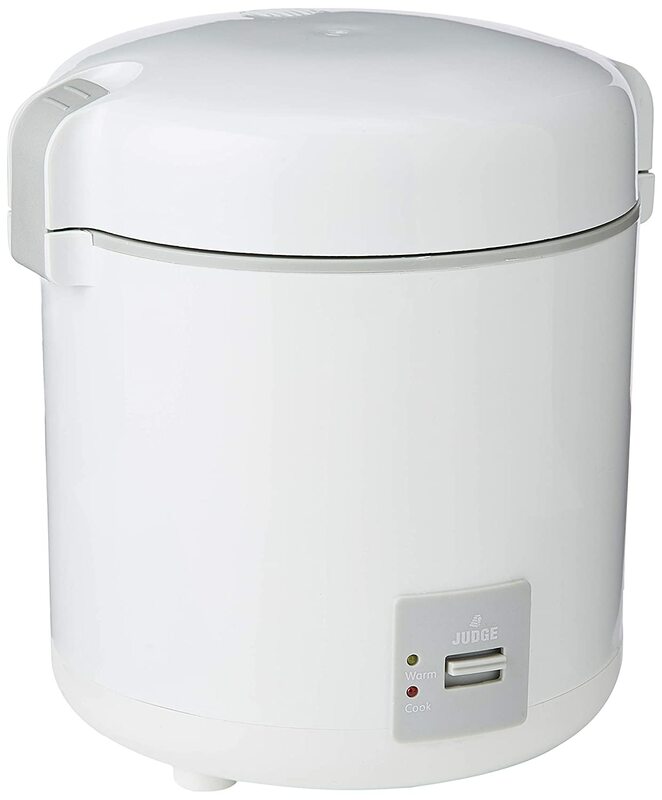 There is nothing fancy about this rice cooker at all, but if you live alone and you want something that is cheap, easy to use and does what it should then this is definitely an option to consider. We hope that after reading our honest reviews you are now able to choose the perfect rice cooker to add to your kitchen.